We are almost two weeks into ownership of our new homestead. While this is an exciting thing it is also very exhausting. Our two little boys, Tractor Man and Tag Along, have been feeling under the weather so it has challenged my time. Even with the illness sweeping our home we were able to get a few new things done on the homestead this week. Painting has been a big job and oddly enough the least expensive part of our updating. 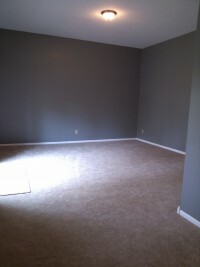 This weeks project was the master bedroom. First, let me say I never thought of having a home with a master bedroom this size. I honestly never pictured having a home this size. I would have been very happy with a smaller cabin that still needed some love but this house was just in the right place and at the right price. Knowing that some hardwork would increase the vaule for the future also helped us to know it was the right choice for us. It has taken three gallons of paint (with the primer included) to cover the walls of this massive room. My husband, Mr.Do-It-All, has agreed that the color will provide us with a bit of relaxation and serenity. We have our own ‘spa’ in the middle of no where! The front door and side door were both screaming for some paint as well so Mr.Do-It-All decided to take care of the front door. I just love the espresso color of this door. It makes such a nice bold statement. 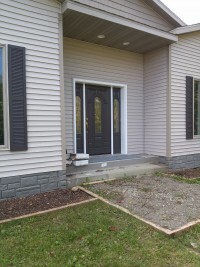 The side door was taken care of as well and required a bit more work. After sanding it down and stripping away some bad materials the door quickly absorbed several coats of paint. It looks so new! The door feels so new with fresh paint. 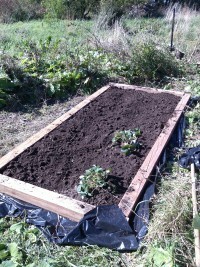 My biggest project this week, aside from the kids, has been clearing ground and putting in my first strawberry bed. Moving all of these plants has been a time consuming task and I am praying that they are able to take solid root before the next frost comes; yes that is correct we have had frost already here in the north. I will be visiting a friend to get more of her runners to add to my next bed. As our list of things to do before the winter sets in gets longer, our days are getting shorter. The darkness is setting in and bringing the colder temperatures. I am starting to wonder if we will be able to get all of the housing structures completed for our livestock before the snow arrives. Starting with a blank slate for our farm has been wonderful but also very challenging. I know we will get it all done in good time one door or wall at a time. Now if Mr.Do-It-All and I could just agree on the best location for the garden. Now for me and the kids it is back to the old place to start packing up the office. Happy Homesteading everyone! Now please tell me your thoughts. What has been the hardest part of making a move for you? Where do you draw the line on what to keep and what to get rid of?